Anytime we spot shishito peppers at the grocery store, we immediately buy them to ensure that this dish gets made in the very near future. The texture of the corn and pepper provide a nice crunch and pop of sweetness to balance out the spiciness of the serrano peppers. The savoriness of the egg and corn with the day old rice really bring the dish together that always leaves us wanting more. 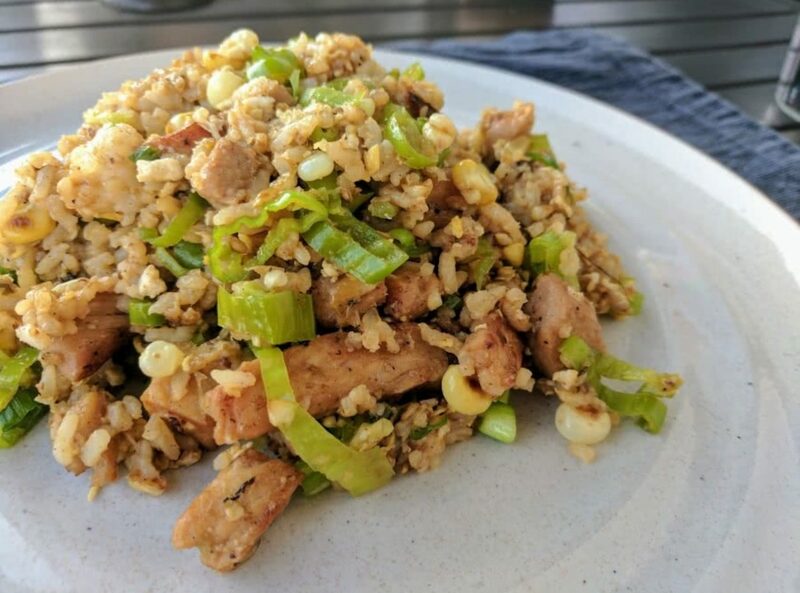 We combine two recipes to ensure that we have a great base pork recipe that is Asian inspired on the flavor spectrum, but any leftovers would do in a pinch. Make sure that the rice is made at least a day ahead of time. We normally use the 1 cup dry jasmine rice to 2 cups of water method with a bay leaf in our rice cooker. Make sure all of your ingredients are ready and pre-chopped near the wok, the recipe goes quickly and having everything within arms reach is crucial. We reduced the amount of shishito peppers slightly and added in serrano peppers for extra spice to the dish.